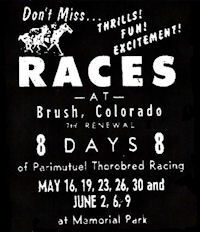 Preceeding Centennial Race Track by one year Memorial Park at the Brush County Fairgrounds would have been the first pari-mutual horse racing track in Colorado. Memorial Park provided fair type racing for about eight days a year, a brief stop on the way to Centennial. Barely making it for my self inflicted cutoff of 1966 Memorial Park was located in the remote outpost of Brush, Colorado. It's run spanned 15 years from 1952 to 1967 another one of those if you didn't live there you probably weren't there tracks. There seems to be no sign that a track ever existed in Brush. Although he was born in Brush, it is unlikely that hall of fame jockey Pat Day ever rode there. In 2014 it's been quite some time since horses thundered around the track in Brush, actually there is no track or sign that there ever was one. It might even be a challenge to find anyone who remembers attending the races there.